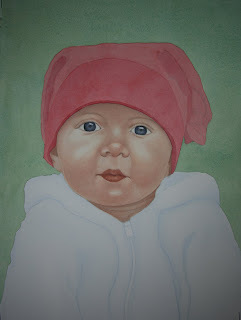 Several layers of red have been added to her hat, many more to go. Her eyes and lips have been softened a bit but still need more softening and her skin will get a bit more of a blush once more of the hat has been painted. More shape will be built up on her sweater as well but very loosely so as not to attract too much attention as being the lightest color I don't want it to draw the eye away from her face. They're coming along great. Love the colour of the hat.